We are just a few short days away from 2018 and all the resolutions that come with the new year. While you may have failed at keeping many resolutions over the years, there’s one you should definitely make – and stick to – this year. Protect your home and your family by resolving to make home security a priority in 2018. If you don’t already have a home security system, resolve to invest in one in 2018. Modern security systems offer more features than ever before but are remarkably affordable. They can be customized to meet your unique needs as well as your budget, and they provide a strong foundation for a safer home. Do a walk-through of your home and property with an experienced security technician this year. Doing so is the best way to determine potential weaknesses that could negatively impact your home’s security. Burglars look for the fastest and easiest ways to access homes. In many cases, they gain entry via passages or entrances that were overlooked by the homeowner. Doing a walk-through with an experienced professional is a good way to take care of anything you may have missed. Most burglaries occur at night simple because thieves prefer to work under the cover of darkness. If you are not home in the evening, having timers installed on your lights will make it look more like someone is there. Lights also deter burglars because they eliminate the darkness that they rely on. You might also want to consider having outdoor lighting installed to illuminate your lawn and keep prowlers at bay. Despite your best efforts, criminals may still gain access to your home. Or you may face a disaster like a fire. 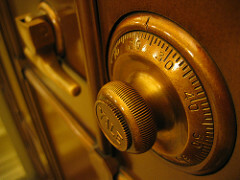 Investing in a fireproof safe ensures that your valuables are protected no matter what happens. Fireproof safes come in all sizes and have various ratings for how much heat they can withstand. Talk to an expert to determine what type of safe is best suited to your needs. The smallest mistakes can provide opportunities for thieves to enter your home. Things like failing to lock the front door when visiting a neighbor or hiding your key in an obvious location could make it easy for burglars to gain entry. In 2018, resolve to make security a priority and to remain conscious of the steps you need to take to ensure the safety of your home and family. At Colorado Security Products, we are here for all of your residential security needs. Contact us today to talk with one of our security experts or to learn more about our products and services. Call 303-756-1000.